This week Nissan announced that it was beginning assembly of its next-gen Nissan Leaf and the quick-charging lithium ion batteries that will power the new version of the automaker's electric car in Tennessee. This new 2013 version of the all-electric car will charge in half the time of the previous model. We went down to the Detroit Auto Show floor to check out Nissan's green-tea-scented stand (you read that right), and found a car that looked pretty much the same as the last-gen LEAF. The heads up display and instrument cluster are still all-digital, and the car still includes navigation, digital gear shift, and all the usual Nissan buttons and gadgets. But there are some real improvements and they're all in the performance. The new Nissan LEAF has improved efficiency given better aerodynamics. It is rated at 107 horsepower and 187 lb-ft of torque, and it is expected to have an improved driving range. We don’t see anything all that different with this LEAF, but we look forward to any extra miles we can eke out of our electric cars. 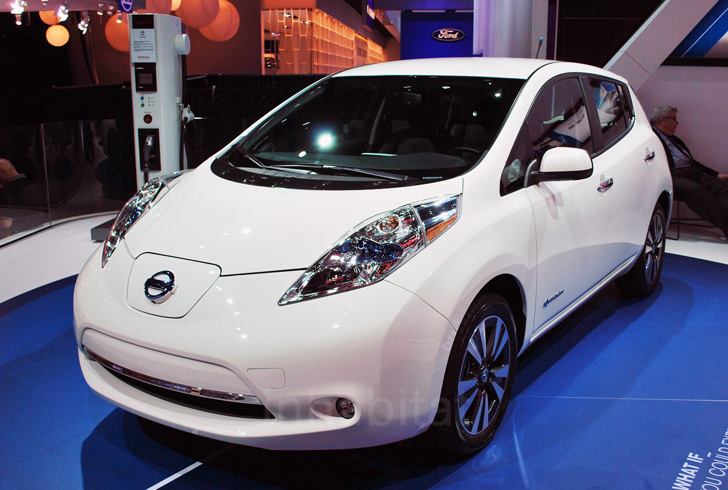 Check out our gallery to see a white Nissan LEAF with all the trimmings from the stand at Detroit. I think maybe it should be called "quicker charging" rather than quick charge. The 2012 Leaf SL had the DCQC port which allows a 80% charge in 30 minutes. The 2013 models (SL & SV) now have a 6.6KW L2 charger as opposed to the 2012 3.3KW charger, so using the L2 charger is twice as fast, the quick charge on the 2013 models are exactly the same speed. Also the entry model S will offer the 6.6KW charger as an optional upgrade for $1300. Also not mentioned is the considerable price cuts for the 2013 models. The new Nissan LEAF has improved efficiency given better aerodynamics. It is rated at 107 horsepower and 187 lb-ft of torque, and it is expected to have an improved driving range. We don't see anything all that different with this LEAF, but we look forward to any extra miles we can eke out of our electric cars. Steering wheel and dashboard detail. 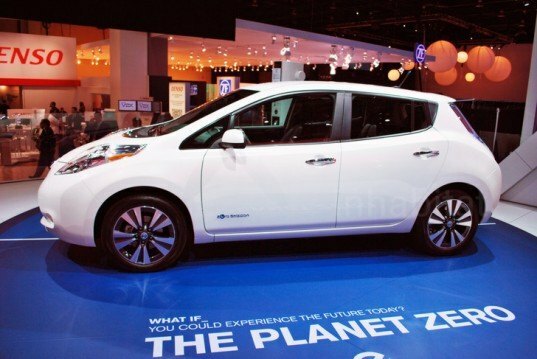 The new Nissan LEAF has improved efficiency given better aerodynamics. It is rated at 107 horsepower and 187 lb-ft of torque, and it is expected to have an improved driving range. We don't see anything all that different with this LEAF, but we look forward to any extra miles we can eke out of our electric cars.